Orbees is a custom IT application development company exclusively serving the higher education universities, business schools and colleges across the U.S. Orbees has expertise in providing IT solutions in the areas of student services, alumni relations, fundraising etc. Orbees is headquartered in Fremont, Silicon Valley with a global delivery center located in Hyderabad, India. Our current customers include several top universities such as UC Berkeley, UCLA, Northwestern University, and UC Irvine. Orbees previously developed several critical solutions for top business schools including HaaS School of Business, Anderson School of Management, and Kellogg School of Management. Orbees is managed by a talented team who, through experience, clearly understand the power of creating niche solutions by leveraging technology that will produce immediate and lasting results. We believe in employing the best and brightest so that we can handle varied requirements of customers. Our employees possess excellent educational qualifications as well as relevant technical skills and experience. We use a rigorous recruitment process that focuses on technical competency as well communication skills, and the aptitude to work in ambiguous situations. At Orbees, our values shape our decisions. They define our strategy, processes, culture and work ethic. There are two important constituents of Orbees - Customers and Employees. We provide the best-value solutions to our customers to meet their business goals. We diligently work alongside our customers to provide solutions to their problems. We measure the quality of our service based on the value we provide to the customer. We maintain the highest ethical and professional standards to be in line with the reputation of our customers. We strive to provide opportunities for our employees to reach their professional and personal potential. 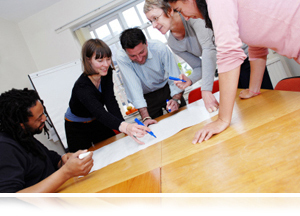 We provide an environment of mutual respect and enjoyable working conditions. The Orbees leadership team has over 85 years of cumulative experience in information technology services, management consulting, and corporate leadership across a broad spectrum of industries. All of the members have advanced technical degrees as well as MBAs from top-tier institutions such as the Haas School of Business, University of California, Berkeley. The leadership team has successfully developed and delivered services/products global organizations and understands how to scale in an optimal, cost-effective manner.